Posted by This close to Halloween, I want to eat a smidge healthier to offset the mini chocolate bars, chips and candy heading our way. And I'll admit... we have a love hate relationship with quinoa. I love it as its a slightly nutty grain, high in protein, fiber and I can generally use it in place of pasta or rice. Some more adventurous folks even sub it out for oatmeal, or grind it down into a flour to add to their baking (sneaky!!). My boyfriend likes it for its flavor and at the same time abhors it because its healthy and good for you. I want to add more of it to our meals and he just doesn't like to eat anything labeled with the evil word: healthy. I'm a firm believer that healthy stuff can taste good, or we can make the foods we love to eat healthier... so hence this version where I subbed out my usual rice or linguine and replaced it with cooked quinoa. And frankly, you add enough garlic, lemon, butter and white wine to anything, its going to taste fantastic. 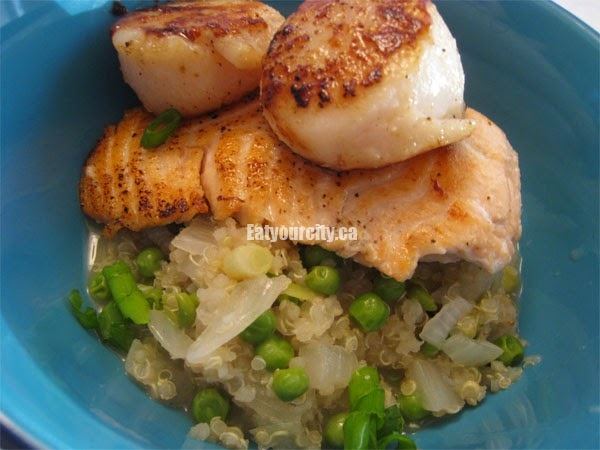 The quinoa makes it a lot less guilty to stuff your face with... and the extra omega 3's from the fish and scallops don't hurt either! To pan sear salmon, you can get away with medium to medium high heat as the naturally fatty fish will release oils as it cooks, giving itself a nice color and finish. For ultra thin pieces (like the belly), you can crank it up to speed things up, but for thicker pieces of fish you want to turn the temp down a bit after all the sides are sealed up so you don't end up with overcooked outer layer and raw center. 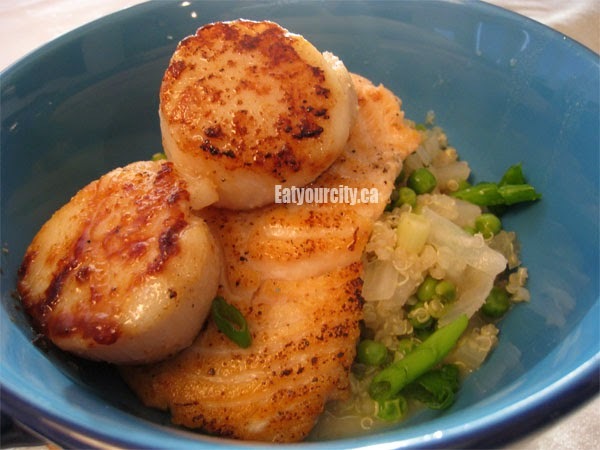 To make perfectly seared scallops, make sure your oil and pan are nearly smoking hot. This ensures all the lovely flavor and juices get sealed in super fast. 1) Toss quinoa, water/chicken broth and garlic into a pot, bring to a boil, cover and reduce heat to low for 15min. Take off heat and let rest an additional 5 min. Drain excess water. 3) In same frying pan, add in shallot/onions, oil, butter and sautee for 30second to infuse the oils with garlic flavor. Add in white wine and chicken broth and boil for 5min or so to reduce the sauce. Add in sugar and drained quinoa. Mix well and cook for additional 2-5min to reheat up the quinoa and to let sauce get absorbed by quinoa. Salt and pepper to taste. 4) Plate quinoa, peppers and seafood... enjoy!